First, apologies to anyone hoping to read a thoughtful assessment of where precisely Oliver Stone's filmmaking stands. I don't have one. 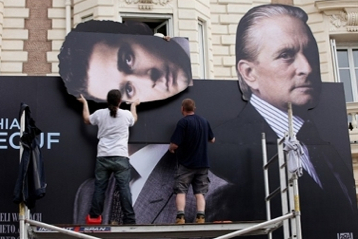 His second installment of "Wall Street" premiered this morning. "Wall Street: Money Never Sleeps" is the full title. And that may be true, but this morning I had to. My phone is missing. I stood up last night to ovate and photograph Manoel De Oliveira (no, I can't get enough of him; and were you here watching him pretend not to be ancient, it'd be just as hard for you). When I sat down, the phone was gone. I'm convinced the theater -- la salle Debussey -- has swallowed it whole or that it's lodged in my seat. I plan to call every night until someone is annoyed enough to answer. Feel free to do the same. But it's beginning to feel like a hopeless cause. In any case, I'd been using the phone as an alarm clock in addition to everything else. So today I had no one to say to me, "Dude, money never sleeps!" I did manage to catch a little of the "Wall Street" press conference as well as the ongoing stress of the hardworking camermen: "Shy-uh! Shy-uh!" While it's true that Shia LaBeouf has the best crypto Judeo-French -- or is it Franco-Jewish?) name in the history of movies ("Monsieur Labuff, over here! "), today he had only the third best facial hair at his press event. Josh Brolin has great brownness growing big around his mouth. That only sounds unappetizing. It was the color of toast. Oliver Stone, meanwhile, was arrived with a sharp aqua suit and fetching grey mustache. It was simple, tasteful, and extremely elegant -- exactly what we don't want from his moviemaking. Although, if "Money Never Sleeps" is half as good as what I was on my way to see before running into Shia and the family Stone, then hello, Ollie! Welcome back to form! If not, I urge him to see more Romanian movies, especially those by Cristi Puiu. Pure cinema is many things to many people. It's many things to me. This morning "pure cinema" was a reduction in which a filmmaker -- Puiu -- distilled a movie to its essential formal elements. The Romanians are superb reductionists. How pure is their cinema? There's very little shot-reverse shot business and zero-tolernance policy for hand-holding -- no soundtrack music, no narration, no frills or frippery. Only what is necessary to produce the most gratifying possible moviegoing experience. I find their approach to filmmaking more palatable than what the Danes, through Dogma 95, tried to achieve in the 1990s with their bid for cinematic purity. There's nothing acutely peevish or petulant with the Romanians. Their lack of flamboyant style doesn't announce itself. It just continues the long, great line of realism that runs back to start of the last century. Puiu's closest forefather is Ã‰ric Rohmer, whose Six Moral Tales Puiu wants to acknowledge with his own moral-minded sextet set in and around Bucharest. 2005's "The Death of Mr. Lazarescu" was the first. "Aurora," which premiered this morning, is the second. So far, Puiu's interest in cinema as an instrument of reality differs from Roemer's insofar as he's interested in societal behavior rather than sexual situations. 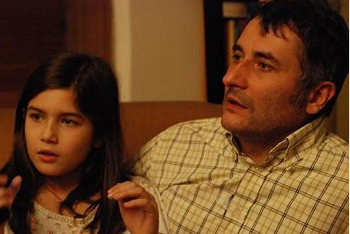 Puiu might be the best in his class at understanding how to tell a story with deceptively minimal effort. "Aurora" confirms a unique formal mastery that extends from the choice to withhold information. A director's statement or press notes might clarify what's going on, but the pleasure and occasional shock that are part of the Romanian experience stem from our piecing the action together. We're invited to spend a day in the life of a man named Viorel; he's an educated, solidly middle-class father, about 41 or 42, and played by Puiu himself. Viorel doesn't appreciate contradiction or second-guessing, and he has a double-barelled rifle packed in a duffle bag. It's very Charles Bronson. We don't know why Viorel wakes up with a woman who appears to be his wife in the opening scene but goes home later to a different apartment that's under renovation. We're left for the better part of three hours (they feel like 90 minutes!) to wonder about what's going on. And: What is the deal with the gun, and why he is using it? Even once we understand, we don't. Which is one of the marvels of this movie and very much part of its point. Should he perhaps become too convinced of his greatness, Puiu risks becoming another Lars von Trier, in which the ego becomes inseparable from his mastery craft. This movie has four cinematographers. I'm not sure what brought that on (Puiu says he couldn't get a look he wanted). But for now, he's just a very good moviemaker. This is the visceral brother to Corneliu Porumboiu's "Police, Adjective," which debuted here last year. Porumboiu's movie was a fiercely intellectual meditation on action, inaction, a kind of only-in-Romania authoritarianism. My buddy Ben Kenigsberg called "Aurora": "Police, Verb." Puiu's meditation is more direct. This time the dictator has a gun. It's refreshing to be in the hands of a director who knows what violence is, who knows what a terrible jolt it is to hear a gunshot, whether it's fired 100 feet away from the camera or 10 inches. Puiu makes killing look easy but keeps it extremely difficult to watch. Every time Viorel pointed his rifle, my seatmate and I covered our eyes. Life still means something in this director's world. So does art.